The Michigan Department of Transportation (MDOT) is celebrating 100 years of transportation. Governor Jennifer Granholm signed a Certificate of Proclamation on behalf of the citizens of Michigan proclaiming 2005 as Transportation Centennial Year. Michigan, home of Henry Ford and the Henry Ford Museum, and known for its automobile industry, has been the birthplace of transportation-related inventions such as the first painted center line, the first mile of concrete road, and the first electric traffic light. 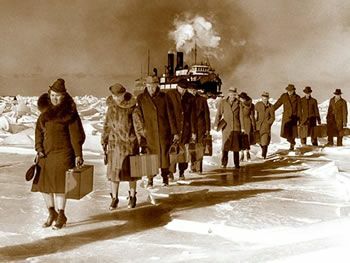 Passengers disembarking from the Michigan State Ferry in winter. MDOT, founded in 1905, has included the celebration on their Web site by posting links to many centennial events and people. MDOT Director Gloria J. Jeff's welcome article whets the reader's appetite to explore the site further. Horatio "Good Roads" Earle was Michigan's first Highway Commissioner and is credited with arranging the first State-aided road built near Cass City in 1905. The first "practical" snow plow, and the building of concrete roads also happened in 1905. Prior to that, in 1901, Earle organized the American Road Makers, which was later named the American Road Builders Association. The Web site's homepage link under The People of MDOT takes the reader to the history of Cass City and the role Horatio Earle, who later became a State Senator and played a part in the building of good roads. 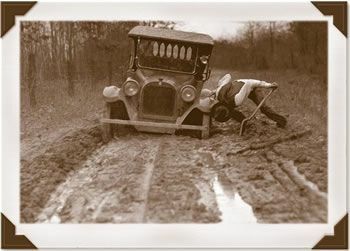 In the early part of the century, mud ruled Michigan's roads. The Mackinac Bridge Photo Gallery and Michigan State Ferry Album take the reader on a visual cruise of Michigan's varied transportation system of bridges, waterways and highways, and the International Bridge Photos that connect Michigan to Canada. Other links explore Michigan's past in pictures. Just for Kids and the Teacher's Corner offer educational articles, such as Michigan's role in the Underground Railroad and the history of the auto industry, but also offer information on careers in transportation. 100 Facts & Firsts recounts events such as construction of the Port Huron Sarnia Tunnel, first underwater railroad tunnel built in 1891; the first Michigan road map with only three roads shown in 1826; and the Nation's first roadside picnic tables in 1929. MDOT's celebration, funded with private donations, will continue all year and will include a Transportation Day at Lansing's Michigan Historical Center on May 14, 2005. Many thanks to Ms. Deb Davis, Office of Communications, Michigan DOT; Mary Drier, Staff Writer, Tuscola County Advisor; and MDOT staff writers, photographers and Web site experts who have contributed their expertise and photography to this article. Visit the MDOT Web site at www.michigan.gov/mdot100 and enjoy 100 years of Michigan's transportation history.